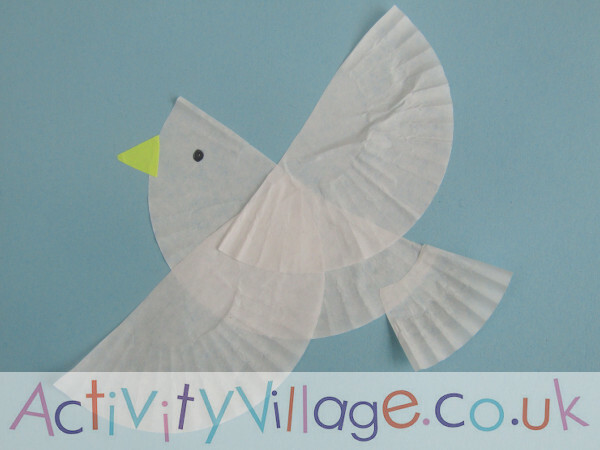 This pretty dove collage using cupcake cases is quick and easy to make, and relatively mess-free, especially if you use a glue stick. It's a good craft for a large group and perfect for Peace Day, MLK Day or Noah's Ark. Flatten one of the cupcake cases and cut in half. Glue one half to the blue card to form the dove's body. Cut a piece of the fluted part of the cupcake case from the remaining half and glue to the body to form the tail. Flatten the second cupcake case and cut in half. Glue both pieces on to form the wings. Cut a beak from yellow paper and stick on. Finish by drawing on an eye. Here is a pdf printable of our finished dove in case you woud like to print it out for reference.